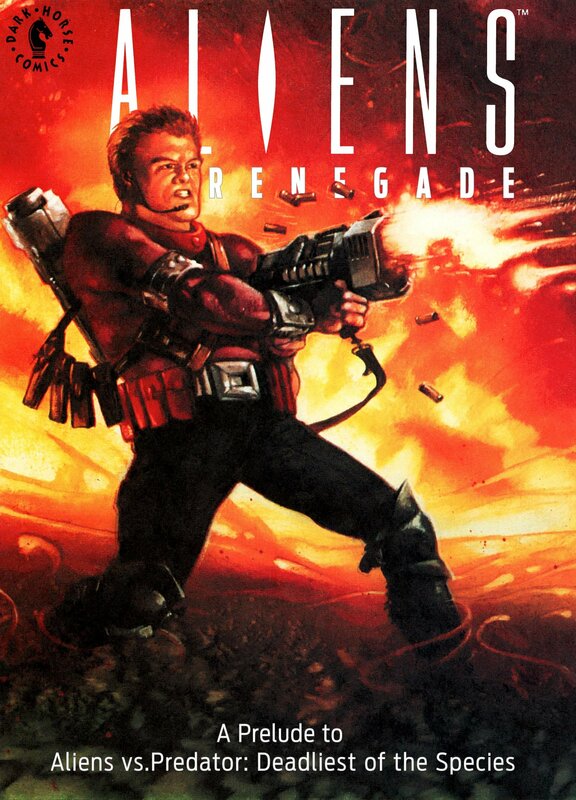 This two-part comic was first published by Dark Horse Comics in 1992 and was originally just titled Renegade. This is a prequel to the story Aliens vs. Predator: Deadliest of the Species. The tranquility of a peace-loving colony world is threatened by the arrival of a band of corporate mercenaries, who plan to size control of the planet. The only person capable of stopping them is the colony’s school teacher, Ash Parnell. Well this is an oddity in the Aliens comic universe, a story that does not feature the Aliens themselves! As the synopsis states this is a story about hostile corporate activities. The Plot is fairly simple; the harmony of an idyllic peaceful-loving colony is threatened when a band of heavily armed corporate mercenaries arrive to forcibly take control. The story revolves around a school teacher on the colony, called Ash Parnell, who has a secret identity which allows her to stand up to the mercenaries. She is the ‘renegade’ of the story’s title. What that actually means I don’t know, as nothing is actually explained. Ash is apparently bulletproof and during the battle she has her head blown off, which she can miraculously heal back on. She can also generate some form of energy-weapon from her hands. Additionally she appears to have metal body under her skin, but flesh and blood is visible as she reattaches her head, so I have no clear idea. During the story Ash fights a mercenary who has similar capabilities to her own, who she simply refers to as a ‘Chimera’, this mercenary refers to humans as ‘organics’. Are they some sort of android or genetically altered humans? Due to the fact that this is an introduction to Aliens vs. Predator: Deadliest of the Species, perhaps these details are revealed in that story, but this story would benefit from a few lines of background explanation. As with many of the Aliens comics I have reviewed I ask does this story stand up in its own right? The conclusion I came up with was; just about. The plot is simple enough and has a clear ending, but is obviously an introduction to a wider story, the major flaw is that it does not explain or clarify who, or what, Ash Parnell is. To me, it feels just like another generic superhero comic, with no relevance to the Aliens universe. The Artwork was competent enough, though I was not a fan of the style, it looked more like a generic Marvel comic with little of the aesthetic feel of the Aliens universe, the ships, uniforms and weapons just didn’t fit. I think this is important as this story is introduced as part of the Aliens universe, and without the Aliens, the visual connection to the universe becomes more important. So in conclusion we have a fairly generic superhero story that really has no real connection the Aliens universe, apart from its title.